"It was such a beautiful property." Have a question for Destiny – An Adventure Farmstay Resort? "Location, staff, food and activities." "The view from rooms and reception area is immaculate." 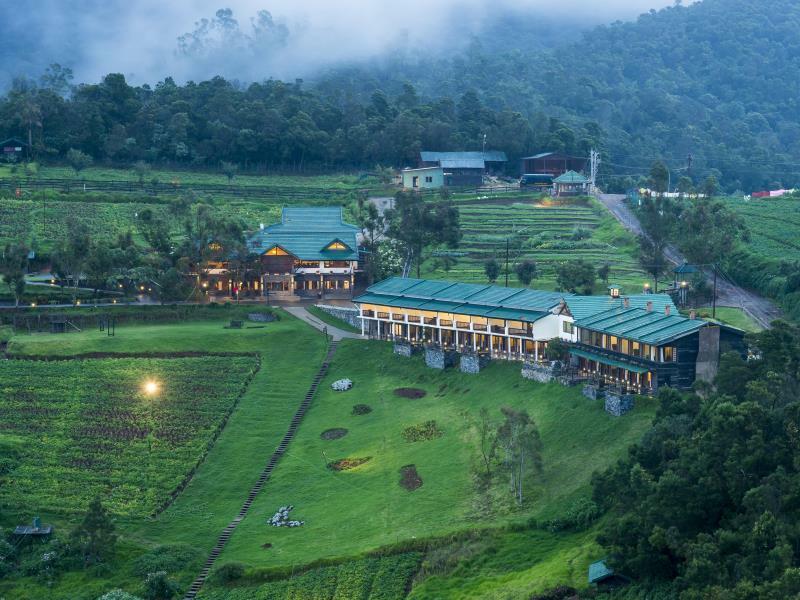 "Everything about the resort is perfect;"
For travelers who want to take in the sights and sounds of Ooty, Destiny – An Adventure Farmstay Resort is the perfect choice. With its location just 22.00 Km from the city center and 100.00 Km from the airport, this 3.5-star hotel attracts numerous travelers each year. No less exceptional is the hotel's easy access to the city's myriad attractions and landmarks, such as Upper Bhavani Lake, Avalanche Lake, Emerald Lake. Take advantage of a wealth of unrivaled services and amenities at this Ooty hotel. To name a few of the hotel's facilities, there are 24-hour room service, free Wi-Fi in all rooms, 24-hour security, daily housekeeping, 24-hour front desk. The hotel features 25 beautifully appointed guest rooms, many of which include television LCD/plasma screen, internet access – wireless, internet access – wireless (complimentary), non smoking rooms, air conditioning. The hotel offers many unique recreational opportunities such as hot tub, hot spring bath, fishing, spa, massage. Enjoy unparalleled services and a truly prestigious address at the Destiny – An Adventure Farmstay Resort. "Private Barbeque is a wonderful experience." It’s an amazing place for all sorts of ppl..
Everything is great except that they do not have a TV or at least a in room wifi. If you are going alone you may get bored. Would not suggest anything less than 2 days to anyone who is planning to stay here. Highly recommended. It is way expensive for the price. Other than the location, there is nothing worth the money - food is OK and expensive, the fun activities are limited. For the same price, you might as well stay at a star rated hotel. Everything about the resort is perfect; location, staff, food and activities. Resort is located in midst of Coonoor hills. The view from rooms and reception area is immaculate. Kids enjoyed Horse ride and host of other activities. Private Barbeque is a wonderful experience. Must try for all travelers. Everything is costly. Since there are no other restaurants, the package should include lunch and dinner. That might be ok. Roads are too rough. Wifi is available only in the lobby and its very slow. In general this is a very beautiful place to stay. There are lots of activities and facilities on offer. The food was really nice, although the restaurant service is poor. For example, we were told breakfast would be available from 8 am, but when we got there at 8:30 we had to wait until 9 to be served. The staff focused on large groups and ignored individual family guests. We also had to wait an hour to be served dinner. Furthermore, since the resort is a farm full of vegetables, it was very disappointing that almost no fresh vegetables were available at the restaurant. There are lots of activities for kids but there isn't enough attention to safety. For example when I asked for kids' helmets when they went on the zip line I was told that there weren't any and "nothing would happen". Although they provide a kids' movie every day, there was only one movie available in English. There are a lot of farm animals and vegetables that the kids can see but the staff did not provide any kind of educational or interesting information for the kids. As the facilities are spread over a wide area it would be helpful if some sort of map or guide were provided. Even the signage is out of date and misleading. In summary, the resort is beautiful with nice facilities, but could be improved by more attention to detail and more considerate service. For what you get, the price is quite high. I have stayed in 5-star hotels in India with world-class service and facilities for a similar price. First of all they offered a room which was not for which i paid for.When i realised it was too late and they just apologized for their mistake.I booked and paid for luxury room and i was given deluxe room. They should charge for whay they hve given but unfortunately i got only an apology. Location is superb. Food is good but you feel very lonely in the restaurant. Staffs are not that friendly. Charges for additional activities are quite expensive. One of our friend suggested this place and the overall experience was good. PROS: Beautiful location- where we get cut out of the rest of the world and have a peaceful time. Excellent service by the resort staff- all were very cordial and ever ready for any help. CONS: Round the clock hot water was not there Room heater must be provided. Very Good. Weather was great. Place is very quiet and scenic. Lake view is really beautiful. The farms, horse riding, Good spa, friendly staff and great food and good variety of activities. A memorable stay. Only negative is a bit overpriced for an additional activities you want to do..